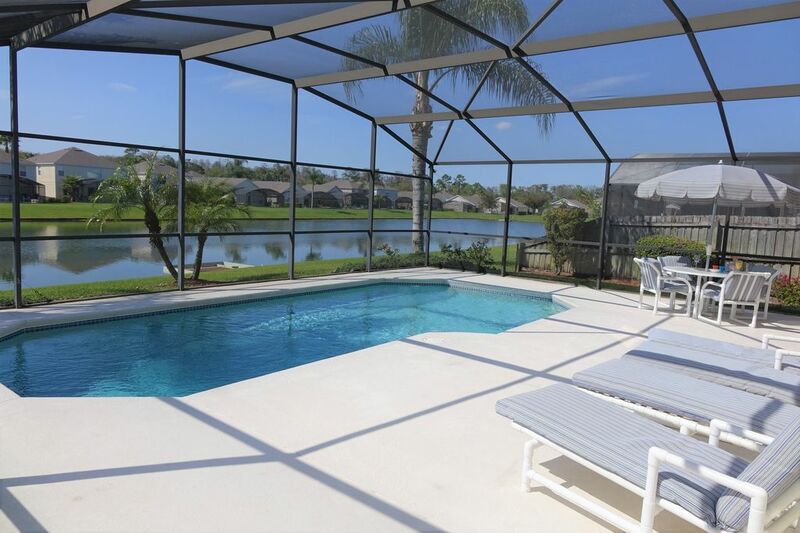 BrightwaterVilla at 24 hour guarded gated Lake Berkley less than 8 miles from Disney World. Situated in a beautiful position, backing on to the lake with plenty of wildlife to watch. Screened heated private pool with lanai. One of the largest pool decks on the resort. West facing pool with spectacular sunsets over the lake. Hot Tub. Side fences - not overlooked. WiFi, free international phone calls and 300 TV channels including English football. 5 bedrooms including 2 master suites with pool and lake views. Ground floor master has patio doors to lanai/pool deck. Full air conditioning. Fully equipped kitchen with dishwasher, microwave, ice dispenser, coffee maker, kettle, teapot. Washing machine, tumble drier. Comfortably furnished with 55 inch 4kTV, 3 DVD players, TV in every bedroom. Upstairs den with double sofa bed, 40 inch HDTV, iPod / iPhone dock. 3 hair dryers. Games room in the garage area with 8' Brunswick slate bed pool table, air hockey, and foosball (table football). We are licensed for maximum 12 guests, We sleep 10 in comfort. 11th and 12th guests are accommodated on a double sofabed in upstairs open plan den...or we have 2 travel cribs for infants. We are baby and toddler friendly - bed side guard, high chair, stair gate, 2 strollers/buggies. OPTIONAL POOL HEAT - please note this is NOT included in rental rate. $20 plus 13.5% sales and tourist taxes, you can request and pay after booking. Recommended October - April, half price May and September. If you prepay and find it too hot, request heat off and we refund unused days with security deposit; or you can request heat on locally. US Dollars by card to PayPal or via HomeAway, or TransferWise, or check. GB Pounds by bank transfer, cheque, TransferWise, or card to PayPal. We love the Florida lifestyle. We visit our Florida home twice a year and replace or upgrade something every time for continuous improvement. We looked at many homes. This one stood out due to the bright airy look and feel. As you walk in the front door, your eyes are drawn straight to the pool deck and lake. Lake Berkley is a beautiful peaceful resort kept immaculately by our valued team of landscapers. We love spending time under the lanai on the spacious pool deck relaxing and watching the ever changing wildlife. Flexible housekeeping service and full mid stay clean available from our local management company on request. Almost everything was super. I would give a 10 overall except hot tub worked 1 night out of 4. A couple of my family complained of springs in bed sticking up and poking them. But mostly we loved it . It was very relaxing, roomy, beautiful, peaceful neighborhood, nice walkway. A lovely spacious villa in a great location, with an awesome lake outlook and large pool with bonus hot tub. The villa was clean, well maintained and the service we received whilst there was great. The location was very central and in close proximity to all tbeme parks and an abundance of very good restaurants eg longhorn steakhouse, outback, logans roadhouse. Thank you for your great review. We are pleased you enjoyed your holiday, and appreciated our home and facilities. Great Pool & Game Room & Fun Time at BrightWater! Very much enjoyed the pool and Game Room! My family is very into the World Cup and they have a nice TV to watch the games. Actually there was a TV in every bed room. The owners were very easy to deal with and offered a late check out at no additional cost. That is so helpful when your flight leaves later and it basically gave us another day to float in the pool. Clean-up was very easy! Just pull off bed linens and towels for their cleaning crew. Other places you have to do Way More! This was easy and quick. We were only a family of 4, but the house is larger than it appears. The upstairs has 4 bedrooms (another one with a private bathroom) and a lounging area -- great for teens or kids to play. I'd bring friends next time, since there is so much private space for all. Thanks again for sharing your home with us! Thank you for your great review. It's nice when guests appreciate our home, facilities, and our efforts. We look forward to welcoming you back with friends. This roomy house was plenty big for two families. The two master bedrooms were very appreciated. The extra TV area was great for the kids and the pool was lots of fun. The house was very clean, the neighborhood was quiet and the drive to Disney and Universal were both under 30 minutes even in traffic. Thank you for your great review. We are pleased you enjoyed your stay, and appreciated our home and facilities. Had a wonderful time . The house was spacious and CLEAN. Sue and David helped us with any questions or concerns. All 10 guys were happy with their stay and complimented me on the nice house I picked for our golf trip. Hope to see this house again next year. Thanks for everything. Thank you. It's good to hear you enjoyed your trip and appreciated our home. Thank you - it was a pleasure having you to stay. Lake Berkley is a private gated, 24 hour guarded community with 3 stocked catch and release fishing lakes, tennis, beach volleyball, basketball, childrens playground, nature trail around the lake. Clubhouse with large heated communal pool, childrens splash pool, spa, fitness centre. Lake Berkley provides everything you need to enjoy a Disney-based holiday. It's close enough to all the action, but also far enough away to enjoy some peace and tranquility. Located within 1 mile of the famous Highway 192 near Medieval Times, you are never far from restaurants, shopping, golf. There is a 24-hour Super Wal-Mart within walking distance with pharmacy. Conveniently situated for Disney World, Universal Studios, Sea World and water parks. Lake Berkley is a peaceful family resort with quiet time requested from 9pm. 13.5% sales & tourist taxes will be added to US$ rates on HomeAway Optional pool heat $20 per day, recommended October - April. Half price September and May Payment methods - US Dollars by card to PayPal or via HomeAway, or TransferWise, or check. GB Pounds by bank transfer, cheque, TransferWise, or card to PayPal.